Louise Ciminieri is squinting at the ceiling and frowning. “This is annoying me right now,” she says. The rectangular area in question, roughly four by three feet, is slightly in front of the hulking brick-lined, coal-fired oven that has produced, since 1924, arguably the greatest pizzas in New York City: Totonno’s. 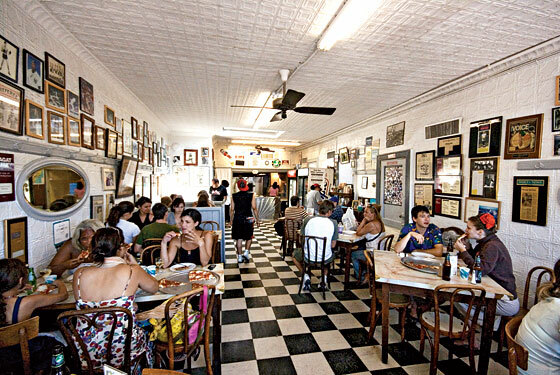 Until this past March, when a huge early-morning fire destroyed the back half of the tiny Coney Island restaurant and called into serious question the existence of a classic—a place defined as much by a timeless look and feel as by the exquisite taste of what it served. I ask about the recipes for the incomparable dough and tomato sauce, whether they were written down and lost in the blaze. She shoots me a disbelieving look I remember from my first visit to Totonno’s: I violated an unwritten rule by attempting to sit and eat a pie I’d ordered in advance over the phone. Louise yelled at me … then agreed to let me stay, a demonstration of her stern yet motherly presence, the ingredient that really holds the place together. Now she doesn’t answer my question about the recipes being at risk in the fire. She merely points to her head. 1524 Neptune Ave., nr. W. 15th St.